What types of gold are there? If you don’t spend a lot of time in a jeweller’s, or digging through grandma’s jewellery box, there’s every possibility you won’t know much about gold. As you become more interested in the more delicate things in life, it’s helpful to become informed of what’s on offer in the way of gold varieties. What are the main types of Gold? When you buy gold jewellery, it’s important to understand that it’s not generally made of pure gold. Instead, it’s a mixture of different metals to create various colours. Silver, nickel, zinc, copper, and palladium can all be used to create what we know as yellow, white, rose, or green gold. The result is a vibrant gold colour that looks stunning when turned into jewellery. Not everyone is a fan of yellow gold, and instead, prefer the subtle beauty of white gold – akin to silver. Instead of purchasing silver, you can opt for a more elegant prestigious and durable white gold piece of jewellery. While it’s simplistic and clean in design, it’s also startlingly beautiful and hard wearing. The manufacturing process of white gold involves a mixture of platinum, and silver which is then plated with rhodium to stop tarnishing. You may find over time that this plating can come off. However, any jeweller can restore this finish so that it looks as good as new. Rose gold is not only popular as a colour choice with everyday household accessories, but it’s also becoming on-trend in jewellery as well. Instead of opting for that more natural gold colour, jewellery manufacturers can mix a little bit of copper into the mixture to create that gorgeous pink shade. Green gold is a little less common, but some people like to buck the trend with their jewellery and opt for something different. To create green gold, copper and silver are mixed with gold which offers a beautiful green hue. Gold plating is used in many different jewellery pieces, as well as for everyday applications, food, and art. Something can be layered in gold, plated in gold, feature intricate gold leafing, or can even be rolled or filled with gold. When you’re looking at jewellery for sale, you will most likely notice 9ct, 10ct, 14ct, 18ct or 22ct stamped on a few different items. Without knowing much about carats, other than the vegetable, it can be challenging to know what that means for your purchase. Carat refers to how much gold is in that item. Anything marked 24ct is 100 percent pure gold but is a rarity on the market. In fact, 24ct gold is not overly functional. It’s easy to bend, you can scratch it, and it’s more suitable for staring at through a glass case. 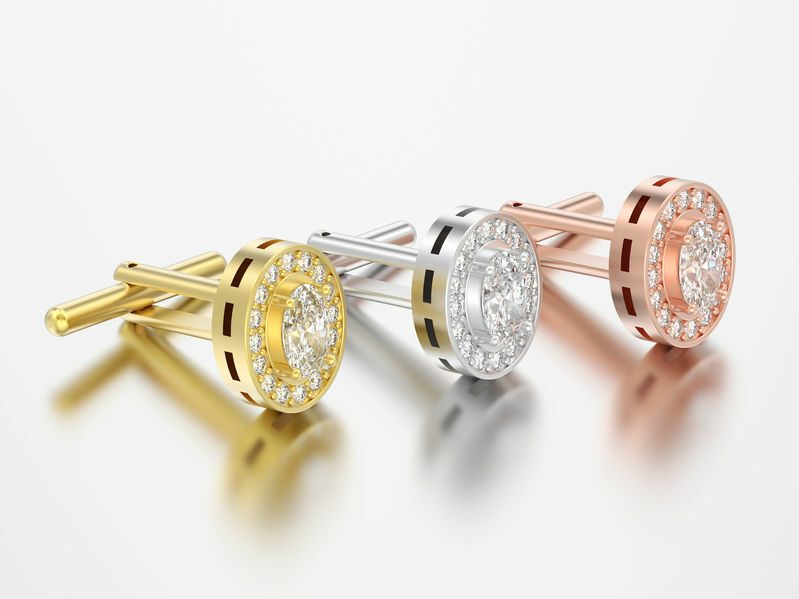 The most common pieces in a jeweller’s shop you’ll come across are 9ct and 18ct. If you find something stamped with 18ct, it’s made of 75 percent gold, with the remaining 25 percent a mixture of materials. The same concept applies to anything under 18ct. A piece of jewellery that is classed as 14ct is 58.5 percent gold and 41.5 percent other metals. 9ct is 37.5% gold and 62.5% other metals. Aside from jewellery, which makes up 75 percent of its demand, gold has a lot of uses. Coins, bullions, and bars are exceptionally valuable – especially for those who foresee the collapse of currency, while there’s also a little bit of gold in computers as well. In fact, there’s even some in most cell phones as an electrical conductor. Gold is also used in the medical and dental industry. Crowns, bridges and fillings all feature at least a small percentage of gold, while medical instruments and machines often do as well. Gold is used in colloidal form for treatment of illnesses such as cancer. Cancer research states that colloidal gold has been used for tumour targeting, using a detection method known as surface enhanced Raman spectroscopy (SERS). And gold nanoparticles have their place, used to help distribute drugs more effectively to cells, tissue, or diseased organs. It’s hard to believe that one simple precious metal can have so many uses and come in so many different varieties. However, you’d be surprised at how in-depth the study of gold can be. The next time you head into a jewellery store, be on the lookout for that gold stamp that tells you all there is to know. Fine Gold is so malleable that one oz. of it can be beaten down to a thickness of 0.000112mm thick and is translucent gold leaf and will cover about 16 square meters. Or, it can be drawn into a wire 0.000127mm diameter and 114 kilometres long. Gold ore with as little 1-part gold to 300,000 parts of useless material can be mined at a profit. Gold is so heavy that one cubic foot of it weighs half a ton. Gold is so soft it is seldom used in its pure form. All the gold ever mined since ancient times would fit into a cube approx. 10 meters each side. As tungsten has the same specific gravity as fine gold, it has been sometimes moulded into gold sized ingots and gold plated so when it is weighed it appears to be the right weight and has been known to be substituted in gold banks! No one has carried out an audit of the gold in Fort Knox for over 30 years and no one knows precisely how much is there. Over half of the gold has been mined in the last 150 years. Gold is chemically inactive and is not affected by air, heat, moisture and ordinary solvents. It is virtually indestructible, hence its value for investment. ©2019 The Gold Man. All rights reserved.